For other uses, see 2016 World Series (disambiguation). Chris Guccione, John Hirschbeck (crew chief), Sam Holbrook, Marvin Hudson, Tony Randazzo, Larry Vanover and Joe West. The Cubs made their eleventh appearance in the World Series; their only previous two championships were in 1907 and 1908. They lost their eight other appearances, in 1906, 1910, 1918, 1929, 1932, 1935, 1938, and 1945 . The Cubs qualified for the postseason by winning the National League Central, ending the regular season with the best record in all of MLB (103–58) for the first time since 1945; they also posted their highest winning percentage since 1935, and won their most games since 1910. The division title was their sixth since division play began in 1969, and their first since 2008. The Cubs entered the postseason as the #1 seed in the National League, and they defeated the 5th-seeded San Francisco Giants 3–1 of the NL Division Series before clinching their first NL pennant since 1945 with a 4–2 series win over the 3rd-seeded Los Angeles Dodgers in the NL Championship Series. For Cubs manager Joe Maddon, it was his second appearance in the World Series as manager – in 2008, he managed the Tampa Bay Rays, who lost 4–1 to the Philadelphia Phillies. It was also Maddon's third World Series appearance overall – in 2002, he was bench coach for the Anaheim Angels. The Indians made their sixth appearance in the World Series. They won two championships in 1920 and 1948. They lost their three most recent appearances in the Fall Classic in 1954, 1995, and 1997. The Indians qualified for the postseason by winning the American League Central, their eighth division title and their first since 2007. The Indians were the #2 seed in the American League, and they defeated the 3rd-seeded Boston Red Sox 3–0 in the AL Division Series before clinching the pennant with a 4–1 victory over the 4th-seeded Toronto Blue Jays in the AL Championship Series. For Indians manager Terry Francona, it was his third appearance in the World Series. He won his previous two appearances – 2004 and 2007 – as manager of the Boston Red Sox, in sweeps of the St. Louis Cardinals and the Colorado Rockies. This was the third postseason meeting between Francona and Maddon. Maddon's Rays defeated Francona's Red Sox in the 2008 American League Championship Series, while Maddon's Rays defeated Francona's Indians in the 2013 American League Wild Card Game. Chicago won the series, 4–3. Former Indians and Cubs player Kenny Lofton threw the ceremonial first pitch before Game 1. Corey Kluber started for the Indians, and Jon Lester started for the Cubs. Kyle Schwarber, who had missed nearly all of the 2016 season after tearing ligaments in his leg in the season's fourth game, was added to the Cubs' World Series roster and started as their designated hitter. Schwarber struck out twice, but also doubled and drew a walk. The double made Schwarber the first non-pitcher to get his first hit of the season in the World Series. Kluber made World Series history by striking out eight hitters in the first three innings. Roberto Pérez became the first ever ninth-place hitter with two homers in a World Series game, the first Indians player to hit two homers in a Series game, and the first Puerto Rican-born player to hit two homers in a World Series game. In the first, the Indians loaded the bases off Lester on a single and two walks before José Ramirez's single drove in a run, then Lester hit Brandon Guyer with a pitch to force in another. Perez's home run in the fourth made it 3−0 Indians. In the eighth, Justin Grimm walked Guyer with two outs and allowed a single to Lonnie Chisenhall, then Hector Rondon allowed Perez's second home run of the night. Andrew Miller and Cody Allen finished the victory for the Indians despite Miller having to pitch out of a bases-loaded jam in the seventh, and the Indians took Game 1 of the series 6–0. Francona's World Series winning streak reached nine with this victory. Leading off the first inning, Dexter Fowler became the first African-American to play for the Cubs in a World Series. 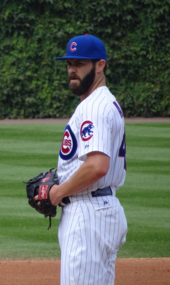 Jake Arrieta earned the win in Game 2. Coco Crisp drove in Game 3's only run. The game's only run came off a Coco Crisp single that scored Michael Martínez from third in the seventh inning. Josh Tomlin, Andrew Miller, Bryan Shaw, and Cody Allen combined to shut out the Cubs. Allen earned his sixth postseason save as Javier Báez struck out swinging to end the game, leaving the tying and winning runs in scoring position. It was the fourth time in which the Cubs had lost in a shutout during the 2016 postseason. Corey Kluber earned his second win of the series in Game 4. The Cubs struck first when Dexter Fowler doubled to lead off the first and scored on Anthony Rizzo's one-out single, but Kluber held them to that one run through six innings before Francona turned it over to the bullpen. In the second, Carlos Santana's leadoff home run off Lackey tied the game; then, with two on, Kluber's RBI single put the Indians up 2−1. Kris Bryant committed two errors in that inning. Next inning, Jason Kipnis hit a leadoff double and scored on Francisco Lindor's single. In the sixth, Lonnie Chisenhall's sacrifice fly with two on off Mike Montgomery made it 4–1 Indians. Next inning, Justin Grimm allowed a leadoff double and one-out hit-by-pitch before being relieved by Travis Wood, who gave up a three-run home run to Kipnis put to the Indians ahead 7–1. The Cubs got one run back in the eighth, on a Dexter Fowler home run off Andrew Miller, which was the first run he gave up in the post-season. With the victory, the Indians were just one win away from a World Series championship. Kris Bryant hit a home run for the Cubs in Game 5. For Game 5, former Cubs star and Hall of Fame member Ryne Sandberg threw the ceremonial first pitch before the start of the game, and Eddie Vedder sang "Take Me Out to the Ball Game" during the seventh-inning stretch. José Ramírez hit a home run for Cleveland in the second inning off Jon Lester, but the Cubs, facing elimination, scored three runs in the fourth inning off Trevor Bauer. Kris Bryant led off the inning with a home run. After Bryant's home run, Anthony Rizzo doubled and Ben Zobrist singled. Addison Russell's RBI single put the Cubs up 2−1. After Jason Heyward struck out, Javier Baez's bunt single moved Zobrist to third before David Ross's sacrifice fly made it 3–1 Cubs. The Indians cut their deficit to 3−2 off Lester in the sixth on Francisco Lindor's RBI single that scored Rajai Davis from second base. With the tying run on second base in the seventh inning, Maddon brought in Aroldis Chapman, who threw ​2 2⁄3 scoreless innings, earning his first save of the series and fourth overall in the postseason. Addison Russell had six runs batted in in Game 6, tying a Series record. The last living member of Cleveland's 1948 World Series championship team, Eddie Robinson, attended Game 6 at Progressive Field. Former Indians pitcher Dennis Martínez threw out the ceremonial first pitch before the game. The Cubs scored three runs in the first inning, all with two outs, on a Kris Bryant home run and a two-run double by Addison Russell after two singles off Josh Tomlin. In the third inning, the Cubs loaded the bases on a walk and two singles off Tomlin, who was relieved by Dan Otero. Following the pitching change, Russell hit the 19th grand slam in World Series history to extend the Cubs lead to 7–0. Russell's grand slam was the first in a World Series game since Paul Konerko of the crosstown Chicago White Sox in 2005, as well as the first by a visiting player since Lonnie Smith in 1992. In the bottom of the fourth, Mike Napoli drove in Jason Kipnis, who doubled to lead off, with an RBI single to cut the deficit to 7–1. In the bottom of the fifth, Kipnis drove a ball over the left field wall for a home run to make it a 7–2 game. In the top of the ninth with a runner on and two outs, Anthony Rizzo hit a two-run home run to right to make it 9–2. In the bottom of the inning, Aroldis Chapman allowed a leadoff walk to Brandon Guyer and was relieved by Pedro Strop, who threw a wild pitch to move Guyer to second and Roberto Perez's RBI single made it 9−3 Cubs with Perez thrown out at second for the second out. After Carlos Santana walked, Travis Wood relieved Strop and got Jason Kipnis to pop out to short to end the game and force a Game 7. Russell's six RBIs tied a World Series single-game record. Arrieta became the first NL starting pitcher to notch two road wins in a single World Series since Bob Gibson in 1967. 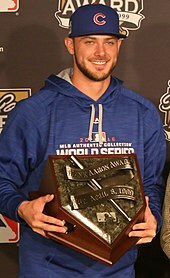 Ben Zobrist won the World Series Most Valuable Player Award. The tarp on the field during the 17 minute rain delay. Cubs first baseman Anthony Rizzo celebrates the final out of the 2016 World Series, after his putout. Chicago Cubs celebrate their World Series championship victory. Game 7 of the series would go down as a classic, with some calling it the greatest Game 7 in World Series history, comparing it to 1960, 1991 and 2001 for its drama and tension. Former Indians player Jim Thome threw the ceremonial first pitch before the game. 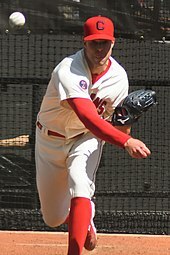 The pitching matchup was between MLB earned run average (ERA) champion Kyle Hendricks, who had started Game 3 for the Cubs, and Corey Kluber, who had won games 1 and 4 and was pitching on three days' rest. Kluber came into the game 4–1 in the postseason with a 0.89 ERA. Lester retired the first two batters in the eighth inning, but was pulled after a José Ramírez single. Maddon opted to use Aroldis Chapman, who had thrown 42 pitches in Game 5 and was used in Game 6 despite the fact that the Cubs had already built a large lead. Brandon Guyer promptly hit a run-scoring double off Chapman, making the score 6–4. The next batter was Indians center fielder Rajai Davis, who had hit 55 career home runs in 11 seasons entering this game, and who was hitting .132 in the postseason up to that point. Davis hit a dramatic 2-run home run off Chapman, just barely clearing the left field wall and the left field foul pole, scoring Guyer and tying the game, making the score 6-6. Davis's home run was the latest-occurring game-tying home run in World Series Game 7 history. Many fans and Chapman himself believe he blew the lead due to his unnecessary use in Game 6. “Chapman, 28, said he felt ‘a little different’ in Game 7 and that fatigue affected him." The Cubs squandered a scoring chance in the top of the 9th. David Ross led off with a walk and Jason Heyward grounded into a fielder's choice to take pinch runner Chris Coghlan off the bases. Heyward stole second and advanced to third on a throw to second by Yan Gomes that got away from Kipnis. Javier Baez attempted a bunt with two strikes, fouling it off for the second out. Dexter Fowler would eventually ground out to end the top of the ninth. Aroldis Chapman returned to the mound for the bottom of the ninth and promptly retired the Indians in order, facing Carlos Santana, Jason Kipnis, and Francisco Lindor, the Indians 1, 2, and 3 hitters. After another intentional walk to Addison Russell, Miguel Montero, who had replaced Ross at catcher and was hitting just .091 in the postseason, singled into left, scoring Rizzo and making the score 8–6. Trevor Bauer relieved Shaw and got out of the bases-loaded jam by striking out Heyward and retiring Baez on a flyout to escape further damage. Carl Edwards Jr. was called on to finish off the Indians in the bottom of the tenth, but after retiring the first two hitters (Mike Napoli and José Ramírez) , he walked Brandon Guyer, who took second base on defensive indifference. Rajai Davis, following up on his eighth-inning heroics, lined a single to center, making it a one-run game, and the score 8-7. Maddon called on Mike Montgomery, who had zero career saves. Montgomery retired Michael Martinez (who had scored the game-winning run in Game 3) with an infield grounder fielded by Bryant, who threw to Rizzo. This ended the game and the World Series, with the Cubs winning the series and ending their 108-year World Series championship drought. Zobrist was awarded the World Series MVP award after hitting .357 in the series and delivering the go-ahead hit. Cubs players celebrating on the field moments after winning Game 7 and the World Series. Initial reports often utilize "fast national" ratings, which are subject to revision. Game 7 had over 40 million viewers, the largest audience for a baseball game since Game 7 of the 1991 World Series, while the series as a whole was the first to average double-digit ratings nationally since 2009. Cubs fans celebrating in Wrigleyville. The Chicago Cubs visit the White House. Following the team's win in Game 7, Cubs fans congregated outside of Wrigley Field and the surrounding Wrigleyville neighborhood to celebrate the championship. On November 4, the team's victory parade began at Wrigley Field and headed down Lake Shore Drive and Michigan Avenue at downtown for a noon rally at Grant Park. Country singer Brett Eldredge sang a cover of "Go, Cubs, Go" during the rally. The city of Chicago estimated that over five million people attended the World Series parade and rally celebration, which would make it one of the largest human gatherings in history. After the season, the Cubs chose to make two traditional White House visits during then-President (and White Sox fan), Barack Obama's final week in office on January 16, 2017, and during President Donald Trump's tenure on June 28, 2017. ^ "2016 World Series Umpires Features Retiring Hirschbeck". Close Call Sports. Retrieved October 21, 2016. ^ Blum, Ronald. "MVP Hosmer, Perez lift AL to All-Star win, Series home field". San Diego. Associated Press. Retrieved July 13, 2016. ^ Normandin, Marc. "2016 MLB playoff schedule released". SBNation.com. Retrieved August 23, 2016. ^ Rosenthal, Phil (October 24, 2016). "How Chicago, the world — and the Cubs — have changed since 1945". Chicago Tribune. Retrieved October 25, 2016. ^ "Chicago Cubs clinch NL Central Division title". Sports Illustrated. September 15, 2016. Retrieved October 25, 2016. ^ a b Ortiz, Jorge (October 23, 2016). "World Series, first glance: Cubs and Indians battle each other – and history". USA Today. Chicago. Retrieved October 25, 2016. ^ Sherlock, Ruth (October 23, 2016). "Chicago Cubs finally shake off 'curse of the Billy Goat' after 71 years with historic baseball win". The Daily Telegraph. Retrieved October 25, 2016. ^ Graham, Bryan (October 23, 2016). "Cubs blank Dodgers to advance to first World Series in 75 years". The Guardian. Chicago. Retrieved October 25, 2016. ^ Meisel, Zack (October 23, 2016). "Cleveland Indians owner Paul Dolan will fly all team employees to a World Series road game". The Plain Dealer. Cleveland: Advance Publications. Retrieved October 25, 2016. ^ Trister, Noah (September 27, 2016). "Indians clinch AL Central crown with 7–4 win over Tigers". Detroit. Associated Press. Retrieved October 25, 2016. ^ "Terry Francona". Retrosheet. Retrieved October 26, 2016. ^ "Chicago Cubs Host First World Series Games in 71 Years". Voice of America. Retrieved November 1, 2016. ^ "Boxscore: Chicago vs. Cleveland, Game 1". Major League Baseball. Retrieved October 25, 2016. ^ "Boxscore: Chicago vs. Cleveland, Game 2". Major League Baseball. Retrieved October 26, 2016. ^ "Boxscore: Cleveland vs. Chicago, Game 3". Major League Baseball. Retrieved October 28, 2016. ^ "Boxscore: Cleveland vs. Chicago, Game 4". Major League Baseball. Retrieved October 29, 2016. ^ "Boxscore: Cleveland vs. Chicago, Game 5". Major League Baseball. Retrieved October 30, 2016. ^ "Boxscore: Chicago vs. Cleveland, Game 6". Major League Baseball. Retrieved November 1, 2016. ^ "Boxscore: Chicago vs. Cleveland, Game 7". Major League Baseball. Retrieved November 2, 2016. ^ a b Meisel, Zack (October 25, 2016). "'95 reunion: Kenny Lofton, Carlos Baerga to throw out ceremonial first pitches before World Series games in Cleveland". The Plain Dealer. Cleveland: Advance Publications. Retrieved October 26, 2016. ^ Assenheimer, Chris (October 24, 2016). "World Series notes: Cy Young candidates Corey Kluber and Jon Lester set to square off in Game 1". The Chronicle-Telegram. Cleveland: Elyria-Lorain Broadcasting Co. Retrieved October 26, 2016. ^ D'Onofrio, Jessica; Elgas, Rob; Horng, Eric; Jordan, Karen; Nagy, Liz (October 25, 2016). "Cleveland Indians defeat Chicago Cubs 6–0 in World Series Game 1". ABC 7 Chicago. Cleveland: ABC, Inc. Retrieved October 26, 2016. ^ McGraw, Daniel (October 25, 2016). "Indians win World Series Game 1 against Cubs as Kluber sets strikeout record". The Guardian. Cleveland. Retrieved October 26, 2016. ^ Reiter, Ben (October 26, 2016). "Kyle Schwarber's successful return a silver lining for Cubs in Game 1 loss". Sports Illustrated. Cleveland. Retrieved October 26, 2016. ^ Snyder, Matt (October 26, 2016). "Cubs-Indians 2016 World Series: Kyle Schwarber's return, at least, was a success". Cleveland: CBSSports.com. Retrieved October 26, 2016. ^ Marchand, Andrew (October 26, 2016). "Corey Kluber sets World Series record with 8 K's in first 3 innings". Cleveland: ESPN. Retrieved October 26, 2016. ^ Berg, Ted (October 26, 2016). "Indians catcher Roberto Perez has as many homers this October as he had all season". USA Today. Cleveland. Retrieved October 26, 2016. ^ Nightengale, Bob (October 26, 2016). "Magic formula: Corey Kluber, Andrew Miller dominant in Game 1 World Series win over Cubs". USA Today. Cleveland. Retrieved October 26, 2016. ^ "Dexter Fowler 1st African-American Chicago Cub to start in Game 1 of World Series". WGN-TV. October 24, 2016. Retrieved July 14, 2017. ^ Breen, Justin (October 24, 2016). "Dexter Fowler Would Be The First Black Cubs Player In The World Series". DNAinfo Chicago. Archived from the original on May 22, 2017. Retrieved July 14, 2017. ^ Footer, Alyson; McCalvy, Adam. "Game 2 bumped up to 7 ET tonight on FOX". MLB.com. Cleveland: MLB Advanced Media. Retrieved October 26, 2016. ^ Anderson, R.J. (October 26, 2016). "Cubs-Indians World Series Game 2: Final score, things to know as Cubs even series". CBSSports.com. Retrieved October 27, 2016. ^ Doolittle, Bradford (October 27, 2016). "Next stop: Chicago! Cubs trounce Tribe, even World Series". Cleveland: ESPN. Retrieved October 27, 2016. ^ Graves, Will (October 27, 2016). "Rizzo, Zobrist lead Cubs' offensive outburst in Game 2". Cleveland. Associated Press. Retrieved October 27, 2016. ^ Nightengale, Bob (October 27, 2016). "Kyle Schwarber defying odds, leads Cubs offense in Game 2 of World Series". USA Today. Cleveland. Retrieved October 27, 2016. ^ Wagner, James (October 27, 2016). "Cubs Pull Even in World Series as Indians' Play Proves Sloppier Than the Weather". The New York Times. Cleveland. Retrieved October 27, 2016. ^ Reiter, Bill (October 27, 2016). "World Series Game 2: Cubs' Arrieta finds greatness when his team needs it most". Cleveland: CBSSports.com. Retrieved October 27, 2016. ^ Martin, Jill (October 27, 2016). "Cubs level World Series with first Fall Classic win since 1945". CNN. Retrieved October 27, 2016. ^ De Luca, Chris (October 28, 2016). "Billy Williams, Bill Murray part of historic World Series Game 3". Chicago Sun-Times. Retrieved October 29, 2016. ^ Mather, Victor; Waldstein, David (October 28, 2016). "World Series: Here's What Happened in Game 3". The New York Times. Retrieved October 29, 2016. ^ a b Bastian, Jordan; Muskat, Carrie (October 29, 2016). "Blank you very much! Tribe 1–0 W epic". MLB.com. Chicago: MLB Advanced Media. Retrieved October 29, 2016. ^ Anderson, R.J. (October 29, 2016). "Indians-Cubs World Series 2016: Maddux, Jenkins to throw out Game 4 first pitch". CBSSports.com. Retrieved October 29, 2016. ^ Bannon, Tim (October 29, 2016). "Vince Vaughn will sing 7th-inning stretch at World Series Game 4". Chicago Tribune. Retrieved October 29, 2016. ^ Waldstein, David (October 29, 2016). "Indians Defeat Sloppy Cubs to Take a 3–1 World Series Lead". The New York Times. Retrieved October 30, 2016. ^ Bastian, Jordan; Muskat, Carrie (October 29, 2016). "3 Won! Tribe blowout has Cubs on brink". MLB.com. Chicago: MLB Advanced Media. Retrieved October 30, 2016. ^ Axisa, Mike (October 30, 2016). "Indians-Cubs World Series 2016: Sandberg to throw out Game 5 first pitch". CBSSports.com. Retrieved October 31, 2016. ^ Castrovince, Anthony (October 31, 2016). "Ramirez's 1st postseason HR gets Indians started". MLB.com. Chicago: MLB Advanced Media. Retrieved October 31, 2016. ^ Muskat, Carrie (October 31, 2016). "Bryant's blast sparks Cubs' winning rally". MLB.com. Chicago: MLB Advanced Media. Retrieved October 31, 2016. ^ Bastian, Jordan; Muskat, Carrie (October 31, 2016). "Chappy Halloween! Cubs' trick? 6 for heat". MLB.com. Chicago: MLB Advanced Media. Retrieved October 31, 2016. ^ a b c Muskat, Carrie (November 1, 2016). "Slam from Russell the Cubs' first in Series history". MLB.com. Cleveland: MLB Advanced Media. Retrieved November 2, 2016. ^ a b Doolittle, Bradford (November 2, 2016). "Addison Russell ties World Series record with 6 RBIs in one game". ESPN. Retrieved November 2, 2016. ^ "The Latest: Francona unsure of left fielder for Game 6". USA Today. Cleveland. Associated Press. October 31, 2016. Retrieved October 31, 2016. ^ Stevenson, Stefan (October 31, 2016). "Eddie Robinson, last link to Indians' 1948 glory, going to Game 6". Fort Worth Star-Telegram. Retrieved November 1, 2016. ^ Meisel, Zack (November 1, 2016). "A presidential pitch: Former Cleveland Indians hurler Dennis Martinez, El Presidente, to throw out first pitch at Game 6". The Plain Dealer. Cleveland: Advance Publications. Retrieved November 1, 2016. ^ McCalvy, Adam (November 1, 2016). "Bryant's HR ignites Cubs' first-inning frenzy". MLB.com. Cleveland: MLB Advanced Media. Retrieved November 2, 2016. ^ Carpenter, Les (November 2, 2016). "Cubs crush Indians to set up historic World Series final". The Guardian. Cleveland. Retrieved November 2, 2016. ^ Christopher Kamka [@@ckamka] (November 1, 2016). "Jake Arrieta first National League pitcher with 2 road wins as a starter in single #WorldSeries since Bob Gibson in 1967 #Cubs" (Tweet). Retrieved November 2, 2016 – via Twitter. ^ Foster, Jason. "The 10 most memorable Game 7s in World Series history, ranked". Chicago: Sporting News. Retrieved December 23, 2016. ^ Armour, Nancy. "Why Cubs, Indians just gave us greatest World Series Game 7 ever". Chicago: USA Today. Retrieved December 23, 2016. ^ Meisel, Zack. "Jim Thome to throw out ceremonial first pitch prior to Game 7 of the World Series". The Plain Dealer. Cleveland: Advance Publications. Retrieved November 2, 2016. ^ "Corey Kluber Postseason Statistics". Baseball Reference. Retrieved November 2, 2016. ^ McCalvy, Adam (November 2, 2016). "Fowler makes history with leadoff HR". MLB.com. Cleveland: MLB Advanced Media. Retrieved November 3, 2016. ^ DiComo, Anthony. "Baez's homer chases Kluber in Game 7". MLB.com. Cleveland: MLB Advanced Media. Retrieved November 2, 2016. ^ Hirsch, Sheldon. "Maddon's Over-Thinking Nearly Cost Cubs". Cleveland: RealClearSports. Retrieved December 23, 2016. ^ Stankevitz, JJ. "Jon Lester ready if needed to pitch out of bullpen in games 6 or 7 of World Series". Chicago: CSN Chicago. Retrieved December 23, 2016. ^ Williams, Cody (November 2, 2016). "World Series 2016: Indians score two on wild pitch, pull closer at 5–3". Fansided. Retrieved November 2, 2016. ^ Smith, Alex (November 2, 2016). "Former SEC star David Ross makes World Series history in final career game". SEC Country. Retrieved November 2, 2016. ^ Spector, Jesse (November 3, 2016). "World Series 2016: Rajai Davis' HR becomes footnote to Cubs' epic victory". Cleveland: SportingNews.com. Retrieved November 3, 2016. ^ Skrbina, Paul. "Aroldis Chapman says Cubs manager Joe Maddon 'abused him a bit'". chicagotribune.com. Retrieved February 21, 2019. ^ Ariel Cheung; Ed Komenda; David Matthews; Evan F. Moore (November 2, 2016). "Game 7 Of The World Series Is In A Rain Delay In Extra Innings". DNA Info. Archived from the original on November 4, 2016. Retrieved November 2, 2016. ^ a b Verducci, Tom (November 14, 2016). "WORLD SERIES It Happened". Sports Illustrated. Retrieved January 7, 2017. ^ Rosenbloom, Steve. "Do you really appreciate what Albert Almora Jr. did in Game 7?". Cleveland: Chicago Tribune. Retrieved December 23, 2016. ^ Kepner, Tyler (November 3, 2016). "With a Cure-Breaking Hit, Ben Zobrist lives a dream he never expected". The New York Times. Retrieved December 23, 2016. ^ Graves, Will (November 3, 2016). "Zobrist's big hit gives Cubs newcomer World Series MVP". Cleveland. Associated Press. Retrieved November 3, 2016. ^ Bastian, Jordan; Muskat, Carrie (November 2, 2016). "Cubs are heavy wait champions!". MLB.com. Cleveland: MLB Advanced Media. Retrieved November 2, 2016. ^ Sullivan, Paul (November 3, 2016). "Chicago Cubs win World Series championship with 8-7 victory over Cleveland Indians". Chicago Tribune. Cleveland. Retrieved November 3, 2016. ^ Berg, Ted (November 3, 2016). "World Series MVP Ben Zobrist: Game 7 was 'an epic battle'". USA Today. Cleveland. Retrieved November 3, 2016. ^ a b Gonzales, Mark (December 6, 2016). "Cubs issue 66 full playoff shares worth $368,871.59 a piece". Chicago Tribune. Tribune Media Company. Retrieved January 2, 2017. ^ a b Stephen, Eric (October 22, 2016). "2016 World Series schedule: Cubs vs. Indians". SBNation.com. Retrieved October 25, 2016. ^ "FOX Sports Embarks on 'Hunt for October' with Announcement of MLB Postseason Broadcaster Lineup". Fox Sports. Retrieved October 30, 2016. ^ "This is how the world watched and listened to the Cubs' win the World Series". For The Win. November 3, 2016. Retrieved February 24, 2017. ^ "RDS présente la SÉRIE MONDIALE en exclusivité francophone du 25 octobre au 2 novembre". Bell Media Press Room (in French). October 24, 2016. Retrieved October 29, 2016. ^ "Cleveland Indians v Chicago Cubs: How to watch the World Series". BT Sport. October 26, 2016. Retrieved October 26, 2016. ^ "Báez y Lindor cruzan caminos nuevamente". WAPA. Retrieved October 26, 2016. ^ "Frequently Asked Questions About Nielsen Ratings". The Futon Critic. September 19, 2010. Retrieved October 31, 2016. ^ Flint, Joe (November 3, 2016). "Chicago Cubs Victory in World Series Game 7 Draws 40 Million Viewers". The Wall Street Journal. Retrieved November 3, 2016. ^ O'Connell, Michael (November 3, 2016). "TV Ratings: World Series Climax Tops 40 Million Viewers, Biggest Game in 25 Years". The Hollywood Reporter. Retrieved November 3, 2016. ^ "FOX, FOX Deportes & FOX Sports GO Combine to Deliver Most-Watched World Series Game 1 Since 2004". Fox Sports. October 26, 2016. Retrieved October 31, 2016. ^ "World Series Game 2 Draws 17.8 Million Viewers for FOX Sports". Fox Sports. October 27, 2016. Retrieved October 31, 2016. 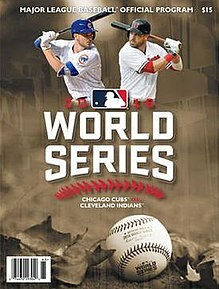 ^ "Indians vs. Cubs Game 3 Is Most-Watched World Series Game 3 Since 2004". Fox Sports. October 29, 2016. Retrieved October 31, 2016. ^ "FOX, FOX Deportes, FOX Sports GO Combine To Deliver 17 Million Viewers For World Series Game 4". Fox Sports. October 30, 2016. Retrieved October 31, 2016. ^ "Indians vs. Cubs Sunday Night is Most-Watched World Series Game 5 Since 1997". Fox Sports. October 31, 2016. Retrieved October 31, 2016. ^ "World Series Game 6 is Most-Watched Game 6 Since 1997". Fox Sports. November 2, 2016. Retrieved November 2, 2016. ^ "World Series Game 7 Averages Over 40 Million Viewers". Fox Sports. November 3, 2016. Retrieved November 3, 2016. ^ Skarka, Michael (October 24, 2016). "ESPN Provides Extensive On-SIte Coverage from the 112th World Series" (Press release). ESPN MediaZone. ^ Lucia, Joe (October 25, 2016). "Your 2016 World Series announcing schedule". Awful Announcing. ^ Kane, Dan (October 26, 2016). "Tom Hamilton not heard on Indians' local radio affiliates during World Series". The Repository. ^ "World Series baseball: Chicago Cubs end 108-year wait for win". BBC Sport. November 3, 2016. Retrieved November 4, 2016. ^ Tsuji, Alysha (November 3, 2016). "Wrigleyville goes wild as Chicago Cubs win the World Series". For the Win USAToday. Gannett Satellite Information Network, LLC. Retrieved December 23, 2016. ^ "Watch Chicago Get the World Series Parade It's Waited 108 Years For". Time. November 4, 2016. Retrieved November 4, 2016. ^ "Watch: Brett Eldridge leads Cubs fans in 'Go Cubs Go'". Comcast SportsNet Chicago. NBC Universal. November 4, 2016. Retrieved November 7, 2016. ^ Flosi, Nic. "Cubs World Series celebration ranks as 7th largest gathering in human history". fox32chicago.com. Fox32. Retrieved November 6, 2016. ^ "President Trump Welcomes the Chicago Cubs to the White House". WhiteHouse.gov. June 29, 2017. Retrieved November 3, 2018. Wikimedia Commons has media related to 2016 World Series.